Captain's Log Starship 1XE, Day 18 in the month April, Earth Calendar year 2018. There they were, 200 warriors strong. Surrounded on the left, surrounded on the right, soldiers closing in on their village. After a grueling trek eluding General Howard and the US Army, Chief Joseph, Looking Glass and the Nez Pearce crossed from Idaho into Montana over Lolo Pass. Howard caught up with them and took them by surprise in the famous Battle of the Big Hole. It was a typical scene, the white man chasing the Indians out of their homeland. The circumstances were tragic with heavy losses on both sides, but the landscape where this occurred was, and still is, remote, rugged, ridiculously beautiful - having all the qualities of a healthy and sustainable environment. The West Pioneer Wilderness Study Area (WSA) is nearby, as are a number of other equally stunning roadless areas managed as WSAs. These areas were set aside because of their wilderness and roadless characteristics and there is now a movement afoot to remove the administrative protection status for these lands. Enter the politics of 2018 in Montana and the continuousness and contiguousness of some of the last best places in Montana, and indeed our country, are under threat of being dismantled. Senator Daines of Montana has introduced a bill that would release these WSAs to other uses like extraction, development or motorized use. Passengers on recent flights out of Butte and Missoula exhibited the willingness of people of this Treasure State to come to the table and initiate compromises where there are multiple uses on the lands, and are open to discussing the issues. This bill does neither. People from Montana recognize the incomparable wildlife values, recreation and hunting opportunities. The problem seems to be the process as many thoughtful conversations and important perspectives were not included in Daines' proposal. 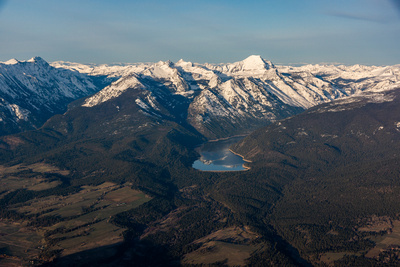 The areas we flew over bordered Wilderness and it was obvious from the air that these landscapes provide a connectivity between larger intact ecosystems, from the Selway-Bitterroot near Hamilton, Montana, to the Frank Church Wilderness over the Idaho border. The conversations in the cockpit told the story. Long-time conservationists and educators, hunters and outdoorsmen, ABC Fox reporters, and local and regional media listened to the pros and cons of the WSAs - from providing critical winter range and habitat for the huge elk herds, lynx and even Fishers in the area, to providing jobs and cutting roads for timber or mining. Montana has a history of Montanans working together, appreciating the natural and cultural heritage of the area. Coalitions representing different interests listening and working with each other has been the norm of late. It is time to stop the political and extremist views and special interests, and accomplish what is best for the people of Montana and their unique and magnificent lands.